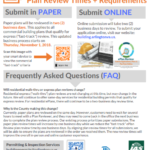 Starting November 1, 2018, paper plans for all commercial building plans that qualify for express (“fast-track”) review will be reviewed in two (2) business days. In addition to the review time change, the submittal requirements for commercial building plans will also change. Three (3) sets of paper plans are required. All other buildings and or structures $0.77 per gross sq. ft. of total floor area or the minimum permit fee ($223.00) whichever is greater. All other buildings and or structures (including tenant layouts) $0.56 per gross sq. ft. of total floor area or the minimum permit fee ($223.00) whichever is greater. All other buildings and or structures Minimum fee of $223.00 for every 10,000 sq. ft. or fraction thereof. All other buildings (construction or replacement) $0.56 per linear. ft. or the minimum permit fee ($223.00) whichever is greater. Commercial buildings (construction or replacement) $0.56 per gross sq. ft. or the minimum permit fee ($223.00) whichever is greater. One & two family detached dwellings and townhouses not more than 3 stories above grade $0.08 per sq. ft. of area affected by revision or the minimum permit fee ($59.00) whichever is greater. Other buildings $0.09 per sq. ft. of area affected by revision or the minimum permit fee ($223.00) whichever is greater. Commercial interior alteration $56.00 per discipline or the minimum permit fee ($223.00) whichever is greater. There shall be no fees assessed for the permit required by the building code for the erection or alteration of a building or structure performed by or for the Washington Metropolitan Area Transit Authority in connection with the construction, alteration, repair or maintenance of bus and rapid rail system or the Northern Virginia Regional Park Authority. No permit required by the building code shall be valid until the prescribed fee has been paid to the treasurer of Arlington County. A filing fee equal to 35 percent of the total permit fee must be paid at the time of permit application filing. The filing fee is included in the total permit fee specified in this ordinance. The filling fee amount shall not be refunded if no permit is issued. Permit fees are calculated and collected for each permit application. When an application includes multiple buildings, a separate fee will be assessed for each building on which construction will be done under the permit as defined in the building code, or as identified by a separate mailing address. If work has commenced, the applicant may return the permit with a written request for cancellation and a pro-rata refund of the fee will be made, based on the remaining, incomplete work; provided further, that such request is made within six (6) months after the date of the permit or the last inspection. See instructions on how to apply for a refund.